Those of use living with diabetes and who connect online see ourselves as a community. Heck we casually toss about the term DOC like anyone has a clue what it means other than the few of us in the club. I had the privilege of listening to one of my heroes, Christel Marchand Aprigliano, challenge a few of us in the diabetes blogging community to think about the 95% of the people who could benefit from the Diabetes Online Community who do not even know that community exists. I have been thinking about that challenge ever since. You know what? It is OK with me if pharma wants an individual relationship. That is fine. They have an important roll in health care. I want pharma to be part of the community if they take a seat, join the conversation, listen and participate openly, honestly and with respect. It is just that I don’t see this ad as open, honest or respectful. 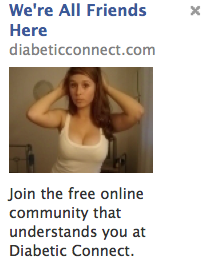 First of all, I'm confused... Is that the social community DiabeticConnect, or someone else using that site to drew people in to clicking on the ad? As for the ad itself, if it's Pharma, I find that incredibly distasteful and completely inappropriate as a way to try and connect with any patient community. They're seriously trying to pass themselves of as a health-focused organization, using that as the connection tool? Seriously. Look at the ad. What market do you think they're targeting there? The male-only ED crowd? Not cool. They sell ads to pharma and sell themselves to pharma as a means of targeting specific groups. So as far as I can tell it's the business DiabeticConnect.com "an alliance health community" running the ad on Facebook to attract visitors to there site who may click the ads on that site and generate revenue for Alliance Health. I doubt the pharmas who buy ads from Alliance / diabeticconnect are aware of how Alliance/DC is seeking to drive traffic to the site. I honestly think the pharma people have more respect for us and their brands than that. I too saw that add, and it rubbed me the wrong way. Seemed kind of skeevy, IMO. Isn't Amy Tenderich in charge of DiabeticConnect? I wonder if she knows about this. I am the CEO of Alliance Health and this ad was brought to our attention just hours ago. It was not designed or approved by anyone in our organization. It does not reflect the values and principles in which we strive to operate or any of our partners including Amy Tenderich. It is true that we run advertisements promoting our various sites including Diabetic Connect. We use various online advertising approaches to market our sites including affiliates that get paid to drive traffic to our sites. This ad unit from an affiliate is not acceptable to us in any way. We will pull it and make steps to prevent this type of mistake in the future. 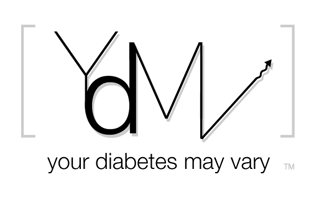 We apologize to anyone within the diabetes community that this mistake has offended. I run the interactive marketing team for Diabetic Connect, and was made aware that someone is using this advertising tactic on Facebook. We have asked our Facebook advertising account manager to help us track down the company utilizing this image (which is clearly inappropriate and one that shouldn't be used to communicate effectively with the diabetes audience). If you see this ad, can you please send me the URL redirect, so I can track down the offending party. My contact info is cwalsh (at) alliancehealth.com. Thanks for your help, and is clearly a tactic that we don't condone.